A century ago, the greatest hotels in southwestern Montana were the spa resorts created at some of the region's natural hot springs. The most impressive by far was the Dakota Hotel, constructed in 1909 at Hunter's Hot Springs east of Livingston. The hotel was large and elegant, the swimming pool and hot springs complimented by tennis courts and a golf course. Quite a place, indeed. 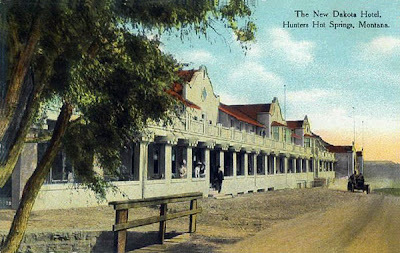 Hot springs resorts fell out of vogue before too long, though, and when the Dakota Hotel burned in 1932 it was never replaced. Only a few tiny remnants of the once-grand resort at Hunter's are still visible, and back in the 90s the springs themselves were piped in, supplying hot water to a Japanese-built hydroponic greenhouse. I think the greenhouse failed, too. There are still several hot springs in this part of the state, fun places to visit ... but destinations like Hunter's are probably gone for good.